Above: Conowingo Dam by Jane Thomas, University of Maryland Center for Environmental Studies. 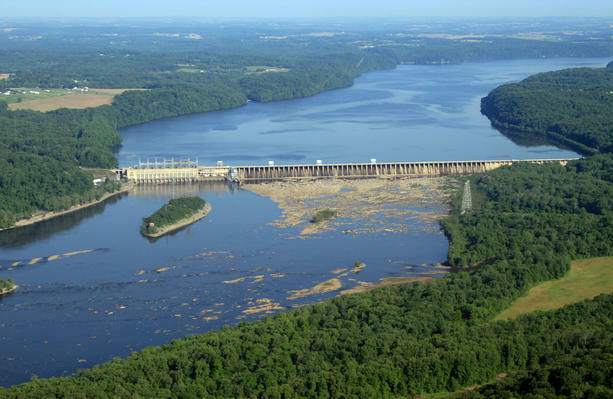 Maryland Department of the Environment has moved to deny a water quality permit for Exelon Corp. to operate the Conowingo Dam — on concerns the dam’s impact on the Chesapeake Bay could undermine state efforts to comply with the Clean Water Act. “MDE intends to deny the application due to insufficient information provided by the applicant regarding the impacts…on state water quality standards,” said MDE Communications Director Jay Apperson in a press release on Tuesday. MDE points to a draft report released Nov. 13 by the Lower Susquehanna River Watershed Assessment, a three-year study MDE conducted with the Army Corps of Engineers that found the dam had lost the ability to trap millions of tons of nutrient-laden sediment that flows from the Susquehanna into the northern third of the Bay. MDE is concerned that the loss of trapping capacity could work against the state’s EPA mandated Watershed Implementation Plans that must meet Clean Water Act standards by 2025. MDE will hold a hearing on Jan. 7 to solicit public comment at their Baltimore headquarters at 1p.m. on Jan. 7. Comments can be submitted up until the end of business day. In addition to licensing from the Federal Energy Regulatory Commission, Exelon must also obtain a Water Quality Certification from MDE that shows compliance with state water standards. Exelon is currently operating on a temporary license from FERC. There is currently 200 million tons of nutrient -laced sediment resting behind the dam. “If it is ultimately determined that the [dam] cannot comply with state water quality standards, the applicant could be required to mitigate the impacts to water quality through, for example, actions taken at the facility or by offsetting the facility’s impacts with pollution reduction activities at other locations in the watershed,” Apperson said. MDE’s decision to hold a public hearing brought praise from Kent County Commissioner Ron Fithian, who also chairs the Clean Chesapeake Coalition, a group of 10 Maryland counties formed two years ago to challenge the “futility” of the WIPs if problems at the dam were not addressed. “By tackling the problems at the dam, we hope it will give our local WIP plans a chance to succeed,” Fithian said. A report from the U.S. Geological Survey in 2012 revealed that 40% of the sediment released behind the dam from 2002 to 2011 resulted from Tropical Storm Lee alone. In what is called a scouring event, sediment and pollutants are churned up and suspended in the water and released out of the dam during heavy storm events. Three environmental groups that conduct advocacy and stewardship for the lower Susquehanna River criticized the report before its release for not considering large storm events that are expected during the 46-year licensing period sought by Exelon. Some environmental groups have accused the Clean Chesapeake Coalition of using the dam as a red herring to escape responsibility for funding their costly WIPs — but this was flatly denied by Fithian when he agreed to chair the coalition two years ago. “This is in no way a time where I’m going to turn my back on the environment and use the Conowingo Dam as a scapegoat,” Fithian said at a commissioners meeting on Nov. 29, 2012 when Kent County voted to join the coalition. The Watershed Implementation Plans put local governments in Maryland on the hook for $14.4 billion through 2025, according to the Maryland Department of Legislative Services. Exelon filed with FERC on Jan. 31 to renew its license through 2060. Under federal law the state has one year to act or “it waives its right to make a decision,” Apperson said. A spokesperson in Gov.-Elect Larry Hogan’s office said they would wait until after the inauguration to discuss any policy direction for the Conowingo.